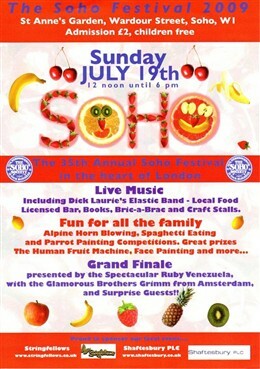 A fair was first held in Soho in 1883, and then intermittently, including a fair and market held in aid of the Soho Hospital for Women in 1939. The fair was revived in 1955 and then continued as an annual event. 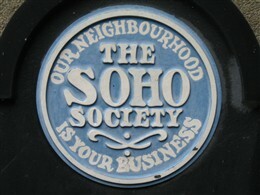 In 1955 the fair was organised by the Soho Association and was inspired particularly by its chairman, Gaston Berlemont, the well known landlord of York Minister public house (now the French House) in Dean Street. 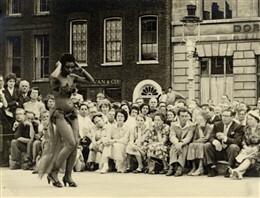 The 1955 fair lasted five days, from 10th-15th July, and was based primarily in Golden Square, with outlying events in St Anne’s Garden, St Anne’s House and Richmond Mews. 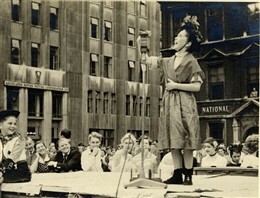 The fair featured many aspects of a typical country fair with a mayoral opening, procession of floats, beauty pageant and Punch and Judy show. 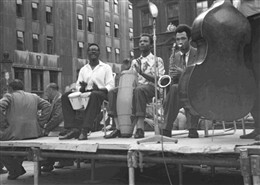 However, the unique character of Soho was reflected in some of the other events including a street race for waiters, poetry reading, jazz, folk and dance performances. 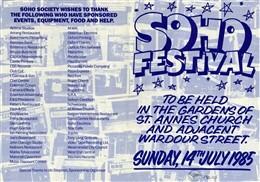 The Soho Festival as it is now called continues to be held as an annual event organised by the Soho Society each July in the grounds of St Anne’s Garden. Among the attractions on offer are a range of food stalls, bric-a-brac stalls, live music and entertainment, including face painting, alpine horn blowing and spaghetti eating competitions.